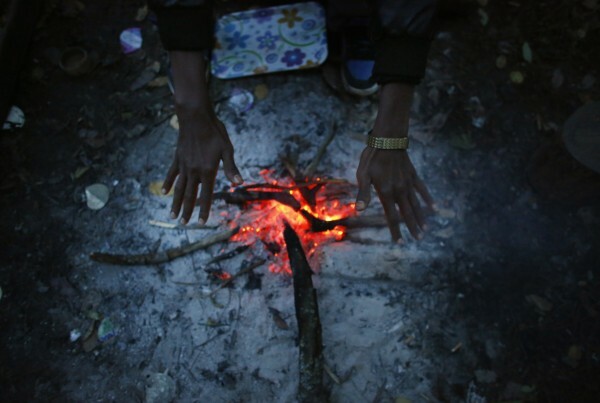 An asylum seeker warms his hand over a fire in a forest near the asylum center in the village of Bogovadja, some 43 miles from Serbia's capital Belgrade November 13, 2013. Whether you’re lost in the woods or stranded in a vehicle in the cold of winter, being able to start a fire can mean the difference between comfort and cold or, in extreme cases, even life and death. Starting a fire under such less-than-ideal conditions can be easier said than done. That’s where FireStarters packets come into play as a great addition to any survival kit. Excellent for outdoor cooking or any other situation that requires starting a fire, each matchbook-size FireStarter packet burns at 1,500 degrees for about 10 minutes — easily enough time to get a fire going in most situations. Only one packet is needed to start a fire, and it’s as simple as putting the FireStarter under the wood, charcoal or other fuel and lighting one corner. FireStarters are odorless and burn clean. Safe for transport, the packets will not self-combust. And because there’s no odor, FireStarters ignite charcoal without the taste and mess of lighter fluid. FireStarters cost $8.99 for a three-pack, and each pack contains six of the fire-starting packets. For more information, including retailers that sell the product or to buy online, check out the Grate Chef website at www.gratechef.com. About: Each matchbook-sized packet burns at 1,500 degrees for 10 minutes. Cost: $8.99 for a three-pack, with six packets to a pack.